The El Paso County Department of Public Works has contracted with Martin Marietta to repave South Academy Boulevard U.S. Highway 115 to B Street in southern Colorado Springs. Weather permitting, the project that will also include repaving of adjacent on and off ramps will begin Monday, Sept. 10 and is expected to be completed at the end of September. Most of the work on the project will be done during nighttime hours, (7 p.m. to 7 a.m.). 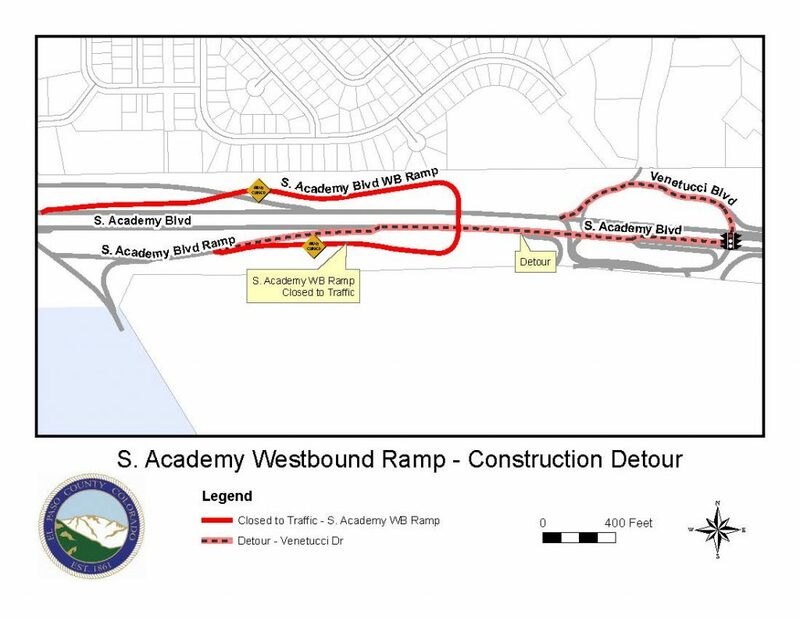 The Academy Boulevard turnaround ramp will be closed and detoured per the attached detour map. Drivers are encouraged to take alternate routes during construction. Those who need to use the detour routes should plan for added travel time through this area. Drivers are reminded to reduce speeds and to watch for workers, equipment, signs and barricades. El Paso County wishes to thank drivers in advance for their cooperation. Any road closures will accelerate the safe and efficient completion of this project. Funding for the work is provided through a TABOR refund of 2016 revenues that was approved by voters in November 2017.